With all due respect to the legions of legendary players the Big East has produced in its storied history, the Big East has always been a coach’s league. This makes perfect sense given that the conference was conceived by, and molded through the eyes of a coach. It was the vision of that coach which propelled the Big East and college basketball to new heights beginning in the early 1980s. 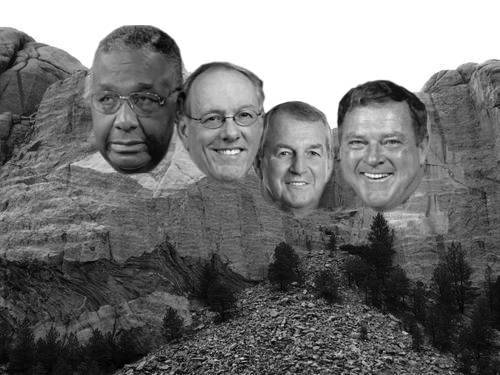 The Mount Rushmore of the Big East resides in its foundation and backbone. In many ways these are the four fathers of the conference. They all made long-term and lasting contributions to the league, and their statures grew in-kind with that of the conference as a result. These four men are your pillars. Dave Gavitt: It is impossible to conceive any reference to the success or history of the Big East without Dave Gavitt at the forefront. A true visionary who gave life to the Big East Conference when he founded it in 1979, Gavitt relinquished a successful coaching career at Providence where he led the Friars to the 1973 NCAA Final Four to devote his attention to building the league as its first commissioner. It is hard to imagine where smaller Catholic schools like Georgetown, St. John’s, Providence , Boston College and Villanova would be today without Gavitt’s influence. He believed that there was an audience for college basketball, a belief that probably saved the relevance of college basketball in the northeast and one that transcended his league, leading to the national television attention and marketing of the sport as we currently know it. Jim Calhoun: The long time Connecticut head coach epitomizes the tenets of the Big East. A New England-born no-nonsense guy and tireless worker who always appears ready for a challenge, Calhoun was hired by Connecticut in 1986. He has led the Huskies to three National Championships, including last season’s historic double where Connecticut came out of nowhere from a ninth-place regular season conference finish to win both the Big East and NCAA Tournaments. The Huskies have made 22 NCAA tournament appearances and four Final Fours under Calhoun’s watch. Further, in this age where football and football money are deemed king, it is important to note that Connecticut has major Division I college football today as a result of the success Calhoun and Connecticut had on the basketball court and not vice versa. Andrew Murawa is the RTC correspondent for the Mountain West and Pac-10 Conferences and an occasional contributor. College Sports is Back on the Calendar! 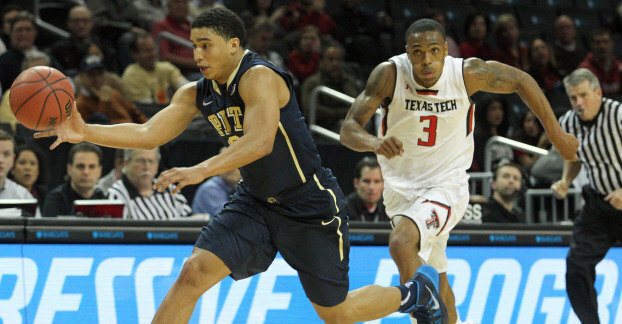 Pittsburgh @ Utah – on Thursday night, with only six other games on. If this was basketball season, and there were only six other games on, you could bet I’d watch some of this. Sure, Utah isn’t going to be very good, but it would be interesting to see Pitt go on the road early into a hostile environment. Murray State @ Kent State – a very good mid-major matchup between one of last season’s Cinderellas and one of the MAC’s always competitive teams. Connecticut @ Michigan – this game just sounds really good, but in reality, UConn is down and Michigan is, well, I would say Michigan is down, but its been awhile since they’ve been up. 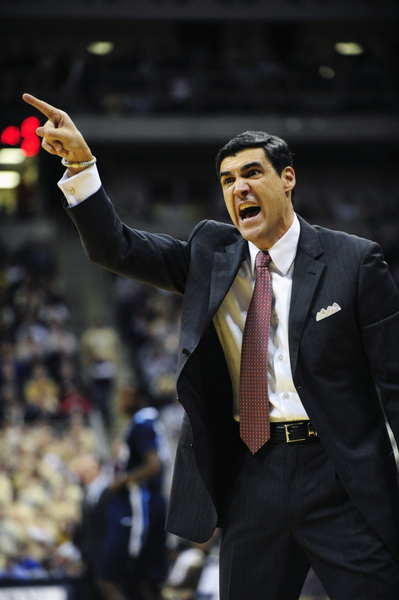 Richmond @ Virginia – a big intrastate matchup between the A-10 and the ACC. If Virginia was just a little bit better, this may have made the cut, because UR will be very good again, but a road trip into the John Paul Jones Arena would be a good early test for Kevin Anderson and company. Northwestern @ Vanderbilt – as enticing as this Wildcat/Commodore matchup would be between two talented teams with NCAA Tournament hopes, this just misses the cut. #10 – Washington State @ Oklahoma State – Klay Thompson, Reggie Moore and DeAngelo Casto invade the Gallagher-Iba Arena to provide a good early season test for a young Cowboy squad minus last season’s two leading scorers. While the young Cowboy guards Ray Penn and Keiton Page keep this close throughout, too much Thompson eventually does them in. 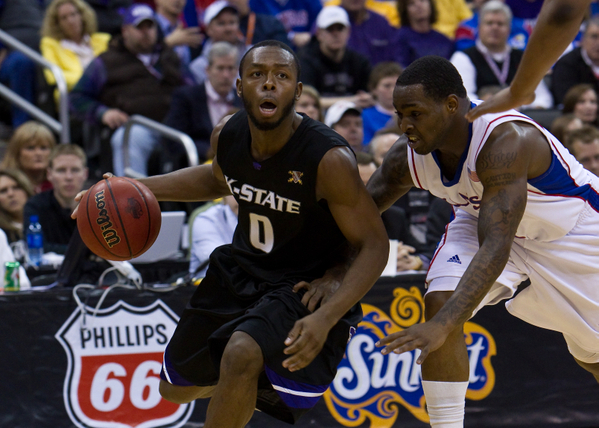 #9 – UCLA @ Kansas State – Kansas State is one of the teams on the short list of national title contenders. UCLA is, well, honestly, not very good at least judging by last season’s performance. 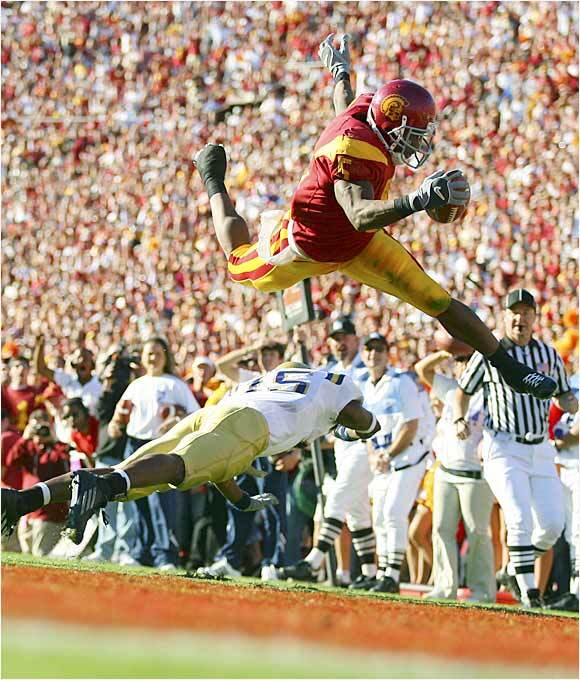 But, they’re still UCLA. And their frontline of Reeves Nelson, Josh Smith and Tyler Honeycutt will test Curtis Kelly, Wally Judge and company, perhaps even to a draw. We’ll also get a first chance to see if the Bruins have even remotely solved their problems at the point, an area of concern that will eventually be the deciding factor in this matchup as Jacob Pullen eventually gets over on Malcolm Lee and the Wildcats pull away in the second half. 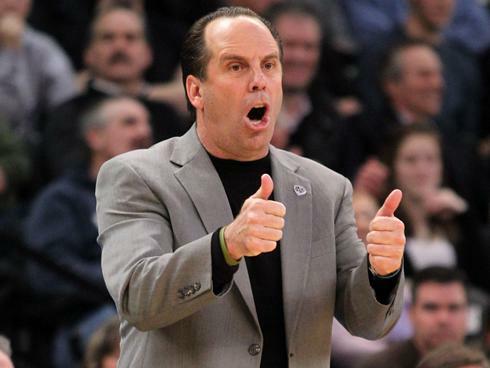 #8 – Syracuse @ Akron – Jim Boeheim taking his Orange on the road early against a Midwest mid-major? Sure, that’ll happen. But, if it did, I’d be thrilled to see my first glimpse of Syracuse freshman center Fab Melo battling the Zips own young center, sophomore seven-footer Zeke Marshall. Sure, the Orange’s talent would probably win out in the end with Akron not having an answer for Kris Joseph, but I’m pretty sure that we’d get at least 30 minutes of pretty compelling basketball here. It turns out that there are still kids at college during the summer. Unfortunately for the athletic department at Notre Dame some of the players on the football and basketball team were arrested while attending an off-campus party late last night. According to reports out of South Bend, 44 individuals were arrested (41 for underage drinking) including 11 athletes. 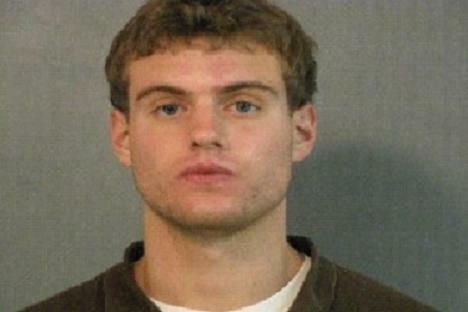 While the 8 Irish football players (one of whom was Nate Montana, son of Joe Montana) will garner most of the national headlines because it is Notre Dame (and they play football), there were two basketball players arrested as well (Tim Abromaitis and incoming Irish point guard Eric Atkins). Although Atkins is a talented point guard who should fit in well with Mike Brey‘s system, the bigger news is the arrest of Abromaitis, who was the team’s leading returning scorer (16.1 PPG) and is expected to take over as the team’s star with the departure of Luke Harangody. Given the nature of the crime (underage drinking), his age (turns 21 on September 17th), and the precedent that the Irish administration with Jimmy Clausen, we don’t expect Abromaitis to get much more than a small non-public slap on the wrist. Our guess is that the most Brey and the Irish administration will do is threaten not to make Abromaitis a captain next year if something similar happens again. If you regularly read this site, you know that the early entry withdrawal deadline for the NBA Draft passed with much zero fanfare at 5 pm ET on Saturday afternoon. Prospective draftees, many of whom were in the middle of exam periods at their schools, had a mere two weeks to make a final decision whether to take the plunge and give up their collegiate eligibility for the dream of NBA riches. The two-week window for withdrawal is a new NCAA rule designed to engender program continuity and recruiting at the expense of the student-athletes they purport to care about. The elephant in the room question is whether players on the fence about declaring for the draft had enough time to be able to properly consider and assess their draft prospects, and the short answer appears to be that they did not. Surprise surprise. Let’s take a quick comparative snapshot of last year’s early entry pool versus this year’s. The 2009 early entries had an additional five-plus weeks to work out for teams, attend the draft combine and communicate with scouts, coaches and family members before making a final call on the matter. It’s quite possible that two months was too much time, but the salient point is that they had plenty of it from which to make an informed decision. 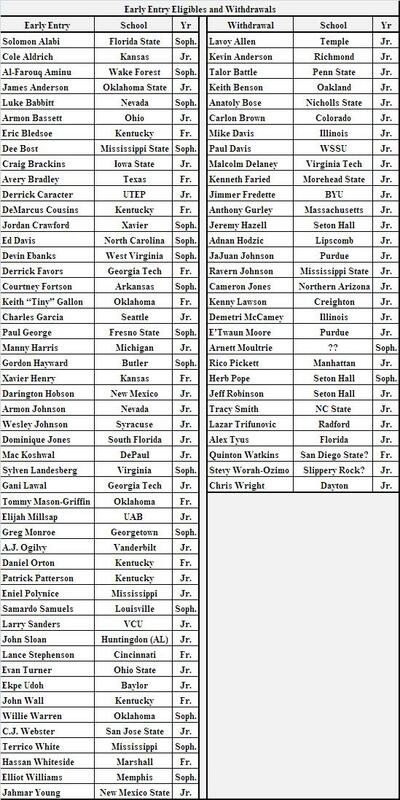 From a pool of 74 underclassmen who originally declared for the NBA Draft, nearly half withdrew resulting in a final total of 39 early entries, two-thirds (26) of whom were ultimately drafted. This year there was a rough equivalent of 80 early entries, but only 30 of those players withdrew by Saturday afternoon’s deadline, leaving 50 hopeful underclassmen jockeying for positions in a 60-pick draft (see above list). Keep in mind that there are numerous international prospects as well as seniors such as Luke Harangody, Damion James, Jarvis Varnado and Jerome Jordan who will also be chosen in late June. NBA teams are not evaluating players yet. As of last week, there were still eight teams playing games, and the others were still closing out their seasons. According to Louisville head coach Rick Pitino who was trying to get information for his sophomore center Samardo Samuels, only one of the thirty NBA teams held player evaluations prior to this year’s May 8 deadline. If the idea behind ‘testing the waters’ is for players to receive accurate evaluations of their game from professional scouts, then we’re at a loss in understanding how this date makes any sense whatsoever. The Chicago Pre-Draft Camp needs to move. This camp that takes place in late May/early June allows fence-sitting players to see how they stack up in drills and workouts against their peers rather than trying to patch together a guesstimate based on little more than rumor and third-hand information. Obviously, the NBA does not care about appeasing the NCAA, but perhaps Stern & company could be persuaded to move it up by a couple of weeks to reach a happy medium. Otherwise, if it doesn’t move, then the NCAA needs to give in and make the deadline fit the calendar of this camp. Looking at the list of early entries above, we see more than a few names who are likely to be incredibly disappointed come draft night — from Bassett to Young and numerous faces in-between, we wonder if these players would have made the same decision if they’d actually been able to, you know, test the waters, as the original concept of the rule was intended. Zach Hayes is a regular RTC writer and resident bracketologist. You can follow his sports-related thoughts at Twitter. Too often during the month-long period between the Final Four and the early entry deadline of the NBA Draft, the media, hoops blogs and talking heads only focus on the underclassmen that have put their name in the hat. Was it the correct decision? Should he come back to school instead? Did that player sign with an agent? These questions should be forwarded and debated, but it seems a distinguished group of players are left out of the national dialogue during this time: college seniors. While most drafted seniors are plucked closer to the end of the second round than the lottery (there’s a reason they stayed in school four years, let’s face it) it doesn’t mean they don’t deserve to be celebrated and acknowledged. 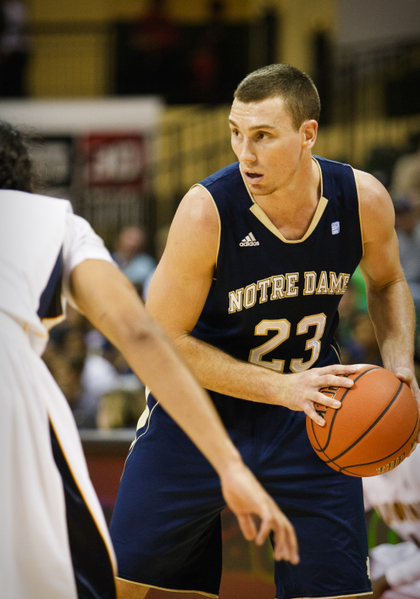 There’s an extensive list of four-year college players that have made a memorable impact for the Association. 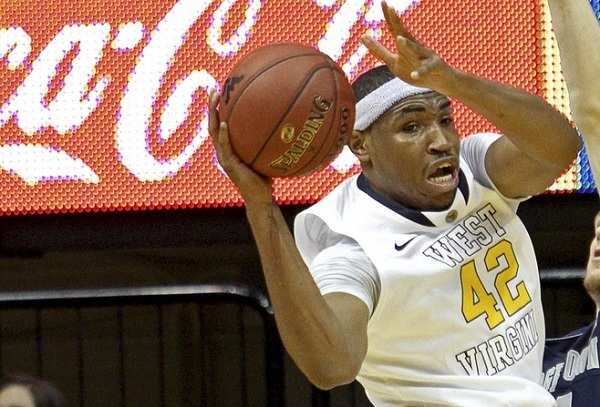 Thus, this article will be devoted entirely to those that battled on the college hardwood for four years, examining their impact on the collegiate game during their long stay and determining how they can have a lasting influence at the next level. 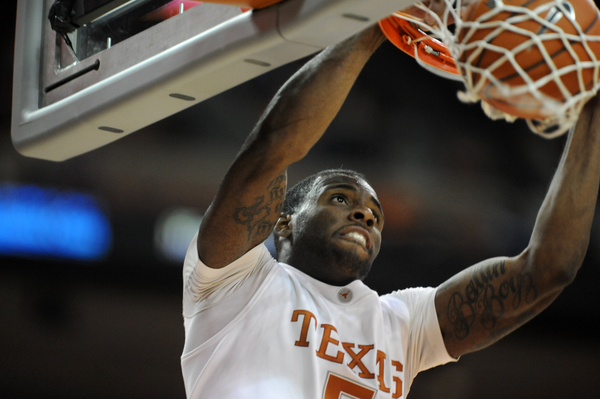 Damion James (Texas)– I wouldn’t rule out another senior sneaking into the first round, but it’s looking likely that James is the lone four-year player to be picked in the top-30. A unanimous selection to the All-Big 12 first team, James averaged a double-double during Texas’ disappointing campaign and passed Nick Collison’s conference record for rebounding. NBA scouts will drool over James’ ferocity in the glass and his superb athleticism. He also features an unblockable mid-range jumper that’s improved in accuracy over his development from a dependable role player to a superstar in one of college basketball’s most premier conferences. While James may not have a defined position at the moment, he will likely build a lengthy NBA career just based on his drive, athleticism, explosiveness, innate rebounding ability and mid-range jumper. James suited up in burnt orange with everyone from D.J. Augustin to Avery Bradley and his name should be lifted to the rafters at the Frank Erwin Center. Quincy Pondexter (Washington)– Displaying awe-inspiring glimpses of potential throughout his first three seasons in Seattle, Pondexter finally molded into the player that every Washington fan so desperately wanted during his senior campaign. Bumping his scoring average over seven points per contest, Pondexter led his Huskies out of the Pac-10 abyss and into the Sweet 16. Pondexter’s consistency- a constant battle that eventually turned into a strength- was never more evident than during Washington’s Pac-10 Tournament final win over California and first and second round triumphs over Marquette and New Mexico. Pondexter poured in a steady 18 points in each contest and shot a clip under 50%, even notching a key offensive rebound and extending his season two days more with a short bank shot that sent the Huskies to the second round. There’s little doubt in my mind Pondexter will continue to harness that natural talent at the next level. His extensive wingspan, ability to score in transition and comfort with defending multiple positions provide just a glance into Pondexter’s value.